Last week's tailings dam breach at the Córrego do Feijão iron ore mine in Brumadinho, near Belo Horizonte in Minas Gerais state in Brazil, is not only an appalling human tragedy but also a major setback to the international mining industry's bid to improve its image and to promote responsible and sustainable mining. The Córrego do Feijão mine is one of four in Vale's Paraoeba complex, which includes two processing plants. The complex produced 26 million tonnes of iron ore in 2017, or about 7 percent of Vale's output, with Córrego do Feijão accounting for 7.8 million tonnes. There have been many tailings dam breaches over the past decades, but Minas Gerais has the worst record, too many serious accidents involving burst tailings dams having occurred in this area. In 2014 three workers were killed when a barrier gave way at a dam belonging to Herculano Mineração, an iron ore mining company. In 2007 heavy rains caused the Mineração Rio Pomba Cataguases bauxite mine to burst leaving 5,000 homeless. In 2001 five workers at the Mineração Rio Verde Ltda iron ore mine were killed when the tailings dam failed. 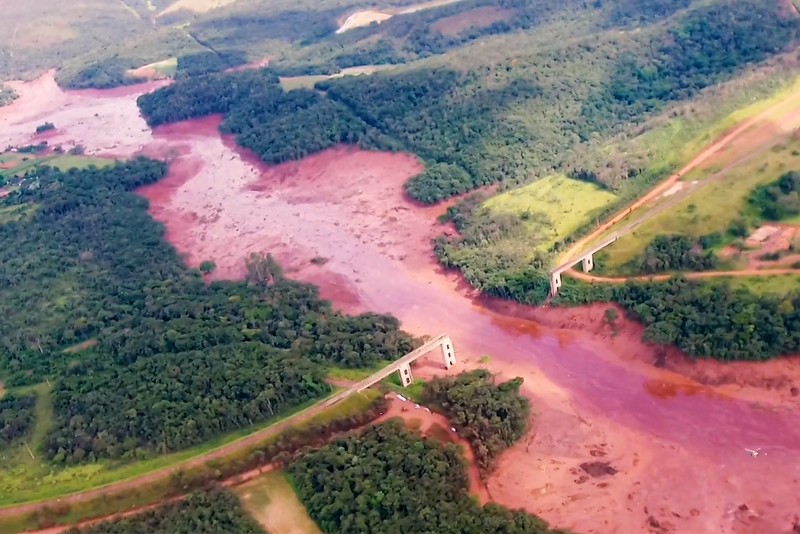 But only three years ago the Bento Rodrigues dam disaster of November 5, 2015 was then the worst environmental disaster in Brazil's history, killing 19 people when the Fundão iron ore containment dam failed and released 60 million cubic meters of iron ore waste. The mine was operated by Samarco, a joint venture between Vale and BHP. It is estimated that between one and four breaches occur each year at tailings dams world-wide, roughly 10 times the failure rate of water dams. The largest tailings dams, at copper mines high in the Peruvian Andes, are colossal, already as tall as the Hoover Dam and have permits to rise even further. Unlike water retention dams, a tailings dam is raised in succession throughout the life of the particular mine. Typically, a base or starter dam is constructed, and as it fills with a mixture of tailings and water, it is raised. The disposal of tailings adds to the production costs so it is necessary to make disposal as cheap and as safe as possible. This requirement led initially to the development of the once commonly used upstream method of tailings dam construction, so named because the centerline of the dam moves upstream into the pond. In this method, a small starter dam is placed at the extreme downstream point and the dam wall is progressively raised on the upstream side. The tailings are discharged by spigoting off the top of the starter dike and, when the initial pond is nearly filled, the dyke is raised and the cycle repeated. Various methods are used to raise the dam; material may be taken from the dried surface of the previously deposited tailings and the cycle repeated, or more commonly, the wall may be built from the coarse fraction of the tailings, separated out by cyclones, or spigots, the fines being directed into the pond. The main advantages of the upstream construction are the low cost and the speed with which the dam can be raised by each successive dike increment. The method suffers from the disadvantage that the dam wall is built on the top of previously deposited unconsolidated slimes retained behind the wall. There is a limiting height to which this type of dam can be built before failure occurs and the tailings flow out and, because of this, the upstream method of construction is now less commonly used. Most modern large dams are now constructed using the downstream method, which evolved as a result of efforts to devise methods for constructing larger and safer tailings dams. This method produces safer dams both in terms of static and seismic loading. It is essentially the reverse of the upstream method, in that as the dam wall is raised, the centerline shifts downstream, and the dam remains founded on coarse tailings Most procedures involve the use of cyclones to produce sand for the dam construction. Downstream dam building is the only method that permits design and construction of tailings dams to acceptable engineering standards. All tailings dams in seismic areas, and all major dams, regardless of their location, should be constructed using some form of the downstream method. The major disadvantage of the technique is the large amount of sand required to raise the dam wall. It may not be possible, especially in the early stages of operation, to produce sufficient sand volumes to maintain the crest of the tailings dam above the rising pond levels. In such cases, either a higher starter dam is required or the sand supply must be augmented with borrowed fill, such procedures increasing the cost of tailings disposal. Several major failures have involved tailings dams constructed with the upstream method. The subsequent enquiry into the Bento Rodrigues disaster identified that the Fundao dam was constructed using the higher risk upstream method, and sands fractions of tailings were used in the embankment construction. In this case, construction defects in the starter dam, combined with insufficient control of the deposition of sands and slimes fractions over several years left an embankment susceptible to failure. To avoid failure, upstream embankments require considerable control over placement of sand and slimes fractions into the tailings storage facility, and limits to the rate at which the embankment is built up to ensure proper compaction and drainage. Some countries, such as Chile, ban the upstream method due to unacceptable risk of failure especially due to earthquakes. The upstream method was also used to construct the dam at Córrego do Feijão , which began taking tailings in 1976 and was closed down three years ago. Two days ago, although Vale had not confirmed why the dam had collapsed, the company announced that it would decommission all 10 of its tailings dams built using the upstream method, all of which are inactive (MEI Online). Vale says that the decommissioning of the upstream dams will be done safely and quickly, and the company will temporarily halt the production of the units where the structures are located. The operation of the halted units will be resumed as soon as the decommissioning works are completed. Mining companies have a huge responsibility to design and maintain their dams to acceptable standards. Feed to the dams is from the mineral processing operations, so how can mineral processors do their bit? Water conservation is now of paramount importance, and as much water as possible is now recycled to the mill, often aided by paste thickening, thus increasing tailings density and reducing the volume of tailings directed to the dams, as well as changing the rheology and the likelihood of failure. Significant safety improvement with the risk of catastrophic dam failure and tailings runout being eliminated can be achieved by 'dry stacking' where the tailings are dewatered, by vacuum or pressure filtration, to a higher degree than paste, and are then transported by conveyor or truck, deposited, spread and compacted to form a stable deposit. Dry stack facilities are particularly suited to areas of high seismic activity and areas where there is limited construction material to develop a conventional retention impoundment. Although more expensive than conventional methods of disposal, dry stacking is inherently safer and is advantageous where water conservation is of critical concern. There is also now much emphasis on selective mining and preconcentration, electronic sorting now being an accepted technique for reducing the quantity of ore processed by grinding and concentration, and in many underground mines a considerable amount of tailings can be mixed with binders to produce backfill, reducing the tonnage sent for surface disposal. Whatever the eventual outcome of the latest catastrophic dam breach, it is another heartbreaking reminder that tailings have not been central to the sustainability agenda of some of the world's largest mines. A good technical summary Barry- thanks for this and lots of food for thought for the industry and tailings management into the future. I believe in detailed tailings characterisation to determine repurposing options for which a thorough mineralogical understanding is necessary. I have read many reports on the disaster but none as clear as this. I have worked on mineral processing operations in many parts of Africa, and was aware that the tailings were sent to dams, but was unaware of methods of construction. Thanks for an excellent review. The fact that the mine welfare facilities and so much other infrastructure was in the path of the stream suggests a lack of planning and risk management. Our thoughts should at this time be with those who have suffered and their families. However in a broader context these images do so much harm to the image of our industry and the care and professionalism we take daily in managing risk and caring for the environment . Upstream construction would never be accepted in Peru, but modified centerline (with a constructed dam rather than cyclone sand) are quite popular. Paste is spectacularly unsuccessful in operations. Dry stacked tailings is good, but expensive and pretty much impossible in high rainfall areas. Tailings and water management are now often higher Capex and take more attention than the plant for new projects. Barry, would the dry stacking system you mention be suited for this area of the world? There is so much additional moisture to deal with..
Maybe Adam's comment above answers your question Vicken? Nice article Barry. What would you have done to prevent the Brumadinho disaster? If you've ever driven the single, potholed tarmac road which goes through the entire province, you'd understand how much planning is needed! And now it's cut in half! However in a broader context these images do so much harm to the image of our industry and the care and professionalism we take daily in managing risk and caring for the environment. a good summary on the importance of tailings dam construction method in terms of its potential for major accident. I would like to point out that to prevent the tailings dam accident regular monitoring and inspection is also important as well as construction method. Therefore , the operator should regularly conducts monitoring and detailed internal and independent inspections of the tailings dam in terms of structural integrity, in addition to the environmental inspections. The human impact of this obviously preventable tragedy has reverberated around the world. This said, as a blog reader and participant I feel humbled and encouraged by the nature of the analysis and the commentary. In particular, the following extract from Barry's analysis seems especially cogent: "Mining companies have a huge responsibility to design and maintain their dams to acceptable standards. Feed to the dams is from the mineral processing operations, so how can mineral processors do their bit? ... Whatever the eventual outcome of the latest catastrophic dam breach, it is another heartbreaking reminder that tailings have not been central to the sustainability agenda of some of the world's largest mines." Clearly this agenda has been deficient, even negligent in this respect, and this must change. Very sad to read on this tragedy--yes, the the management failed miserably and it is also a blot on the mining profession , which we claim as an age old one. By now why all Professional Societies and Mine Safety Authorities have not come up with a "ready reckoner" for tailing dam construction, inspection and maintenance and sensors to give alarm signals installed.Just as we have "black boxes"in the cockpit of a aircraft,can we not think of a fool proof monitoring system which no one can tamper and records and sends signals to a central place as a record. I might not have articulated well because I am not a mining engineer but I am sure top Mining Schools can produce few Ph.D.s to come up with"problems and foolproof safety systems" on an issue like this. Since 20 years, mining waste management has been percieved to be the major issue for socially and environmentaly sustainable mining. One of the reason is still occurring accidents of tailings dam. Because of the increasing scale of liabilities associated with mining waste, it can be accepted that a mine project is rather a mining waste management project. Barry thank you, a great concise overview of tailings dam design and some interesting comments. Particular Adam Johnston's comment on Paste as "spectacularly unsuccessful". 10 years ago it was the next best thing, and it is true that the perspective of what it would be and what it has become are far away from each other, so much so that using the term "Paste" for surface is rarely used in our company so as to not confuse the concept with Paste Backfill for underground which is a completely different story. We are now seeing the same interest in dry stack as "paste" 10 years ago, practically every project we are looking at has some consideration to dry stack from the smallest 20 tph to the 4000 tph plants. I hope to present a paper at Physical Separation'19 on what some of the issues with Paste are and how can we stop dry stack from going the way of Paste. I would be interesting in any operational inputs on the subject.